As part of my year of INSPIRATION, each month I am challenging myself to scrap my Top Five (photos or stories or events) from the previous month, although I am quite behind on this goal. However, this week I am using INSPIRATION from the Scrapping Everyday Miracles Birthday Mini Crop challenges to get some of my Top Five scrapped. Challenge #1 was to create a layout using a "recipe" based on your birth date. 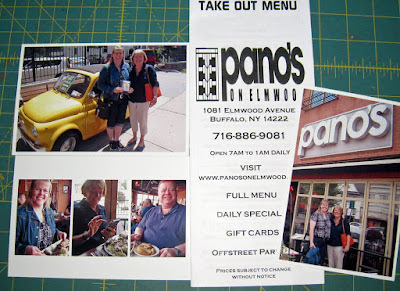 The number of photos, types of supplies and techniques are determined by the month, day and year of your birth. Based on this FUN formula, here are the "ingredients" for my layout. Three Photos - Because my birthday is in July, I needed three photos, which I printed here at home . . . well, one of them is actually a collage of three photos. I also pulled a piece of memorabilia that went along with this story. A Base & Two Patterned Papers - The directions were to start with the papers and a title, but since I like to pull colors from the photos, I started there, then pulled a white cardstock base and two patterned papers from my stash. 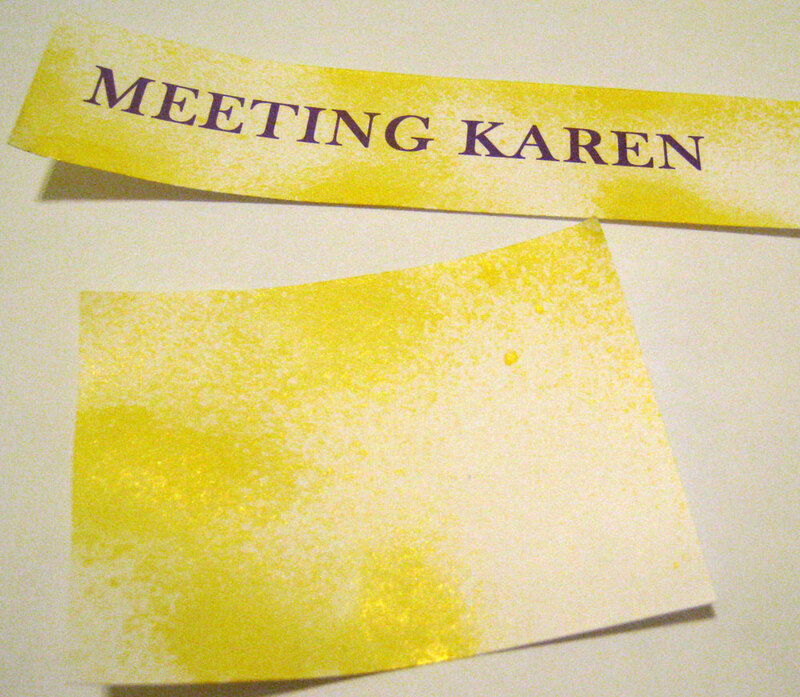 I already knew I wanted my title to be "Meeting Karen." 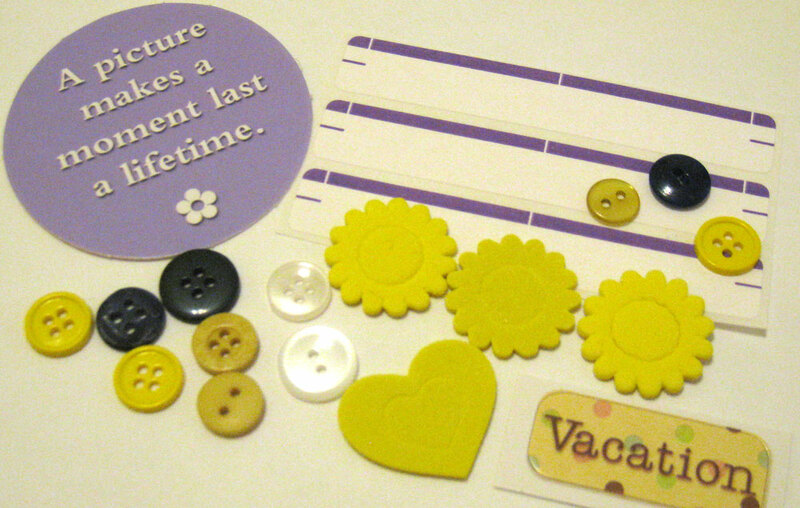 Buttons & Stickers - My birth date dictated that I use buttons and stickers as embellishments. I pulled a small assortment of items, although I ended up not using them all. I did use the yellow flowers (stickers), one of the purple labels (sticker), and six of the buttons. Inking & Misting - Because I was born in the 60s (at the very end! ), I needed to include inking and misting techniques on my page. I inked the edges of all my papers and used spray mist on a couple of scrap pieces of cardstock. I printed my title onto one of those pieces. I printed my journaling for this layout from this post and set to work incorporating all these various pieces onto one page. 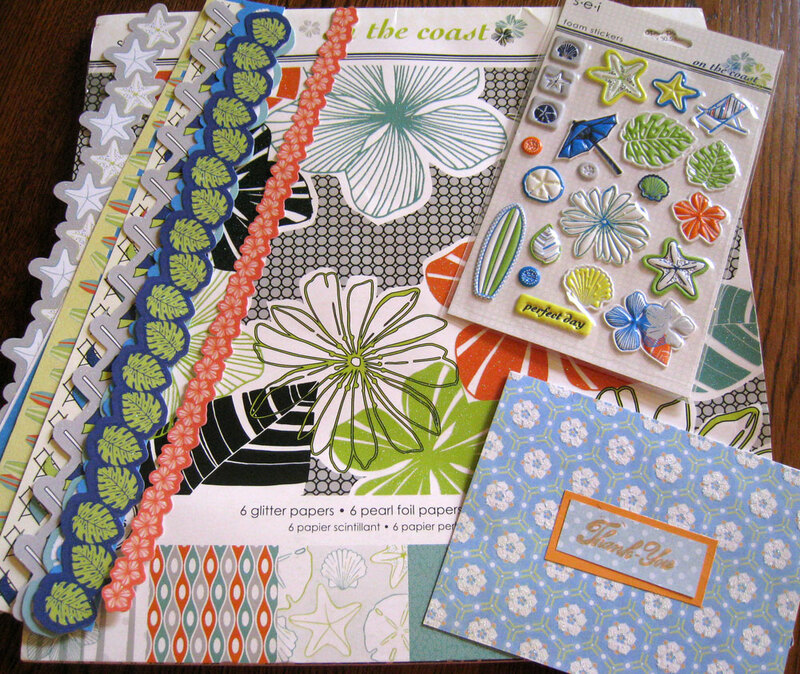 I ended up with a grid-type design and three embellishment clusters with the yellow flower stickers and buttons. I'm absolutely thrilled with the way this layout turned out and enjoyed the INSPIRATION provided by this Birthday Recipe challenge! This is my second time to join in with a challenge at Scrapping Everyday Miracles. The first was when I used the August sketch for my Little Green Arrows layout. I'm excited to announce that I was chosen as one of the Top Three entries for August . . . AND I was chosen by the random number generator as the prize winner for the month! 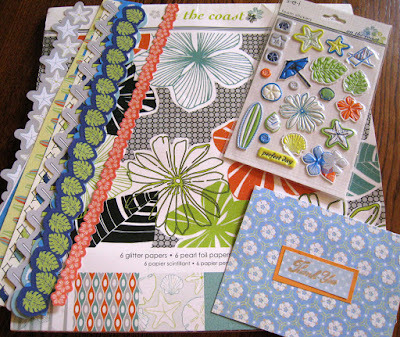 Check out the happy mail prize package that I received this week!! There are six challenges posted over at Scrapping Everyday Miracles open until the end of the month. I'm planning to try a few more this week. Anyone want to join me? That's a very interesting formula for a layout..someone has a great imagination! It certainly seems to work.. This is beautiful! Amazing job on this...and perfect for the Birthday Bash celebration challenge! Thanks for playing along with us at Scrapping Everyday Miracles. So much fun to relive our lunch together! Great layout! I love your view master reels! The perfect touch to your cool layouts. You did a great job on these. 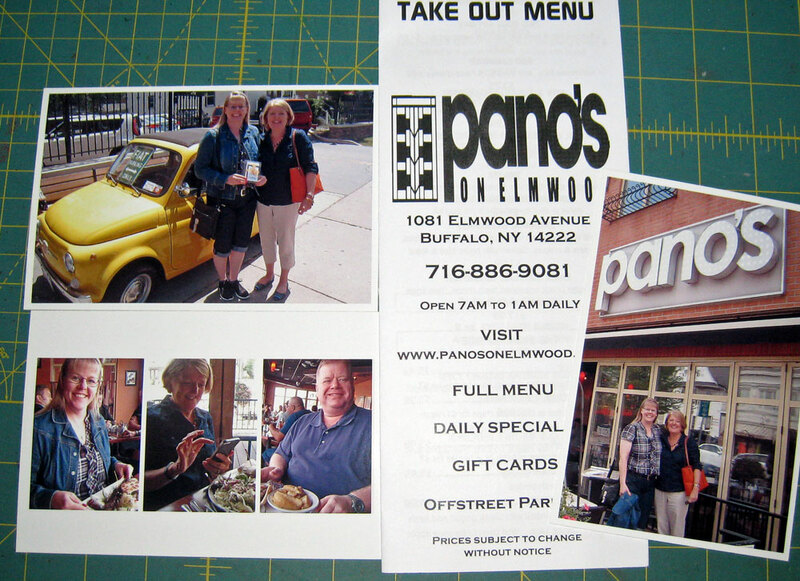 What a FUN layout - looks like you and Karen had a wonderful time! She is so sweet! Awesome layout!! I love the misting you did and the way you put it all together! Thanks so much for joining us for the SEM Birthday Bash!